In North American birding this week, excitement over what might forever be known as “The Checklist” – a stupefying spring migration report from Tadoussac, Quebec highlighted by a truly astronomical count of over 700,000 wood-warblers – quickly gave way to the equally astonishing news of an apparent Tahiti Petrel appearing before a pelagic trip in the waters off North Carolina – a potential record not only for both the state (“Tarheel-ti Petrel”, anyone?) and the continental ABA area, but possibly the Atlantic Ocean itself. My own birding experience in upstate New York this week was much more mundane, with dwindling numbers of Blackpoll Warblers signaling the end of spring migration and prompting my return to a normal sleep schedule. So, I looked for a beer with which to commemorate either of these more momentous events – perhaps a beer made from 700,000 varieties of hops (not yet, but I’m sure it’s coming!) or one featuring any sort of petrel – doesn’t even have to be from the South Pacific, I’m not picky! Not surprisingly, I struck out on both counts, but I do have a wonderful IPA by a North Carolina brewery with a dark nautical theme and some angry-looking gulls on the can, so it’ll do for a liquid tribute to the pelagic report. 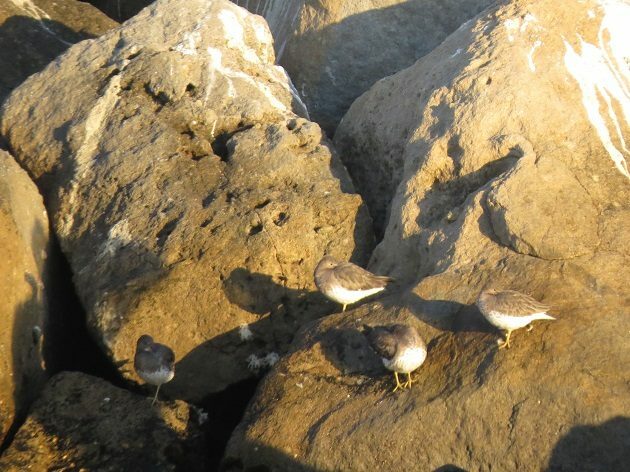 I swear I wasn’t drinking when I took this photo of my lifer Surfbirds (Calidris virgata) on a pelagic trip to California’s Half Moon Bay in October 2017 – I’m just not a very good photographer! 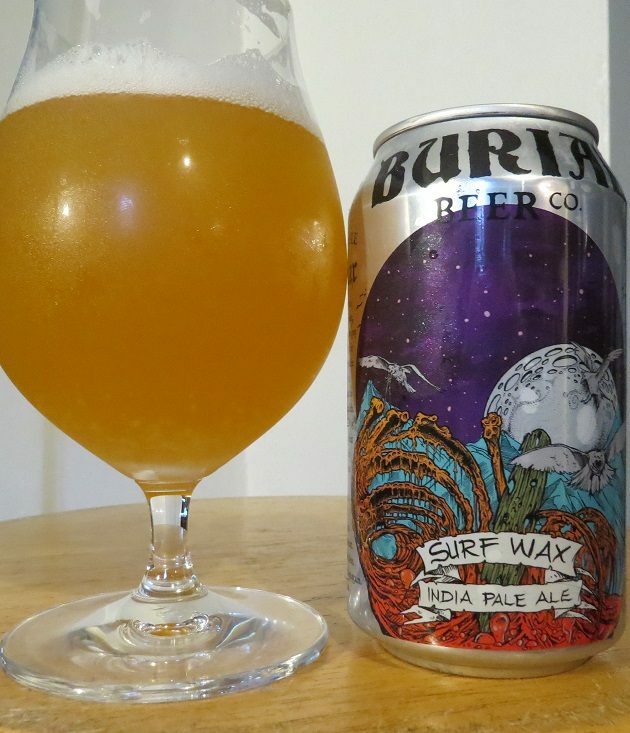 I first bought a few cans of Surf Wax India Pale Ale by Burial Brewing Co. of Ashville in June two years ago to take aboard a pelagic trip of my own, sailing out of Brooklyn, New York. I don’t necessarily advocate drinking while birding at sea – especially for those poor souls prone to seasickness – but personally, I like to crack open a can of something cool and hoppy for the long, lazy cruise back to port, especially when the birding generally quiets down and passengers begin nodding off on the deck in the warm afternoon sun. I knew from previous trips that this boat’s galley sold Budweiser – and yes, I know there’s a bird on the can – but that stuff’s enough to turn even my hardy, cast-iron gut, so I always make sure to BYOB at sea. But my cans of Surf Wax never made it out to the briny deep: the trip was cancelled due to inclement weather, forcing me to enjoy my IPA in decidedly less maritime conditions. at home on my couch in Albany. Wherever you drink it, Surf Wax is a great IPA in the West Coast vein, made with four popular varieties of hops: Mosaic, Centennial, Citra, and Columbus. Pouring a hazy, sunglow yellow and capped with a thick, snowy head, the hoppy Surf Wax pushes tropical fruit aromas of passionfruit and pineapple to the forefront. A blast of mango straddles the line between these tropical aromas and a strong, piney hop presence, but there’s a gentler undercurrent of peaches and blueberries as well – the latter being a noted Mosaic hop contribution. The palate is more citrusy, with grapefruit and tangerine predominating, rounded out by more berries and a light touch of wheat. A long, bitter finish of marmalade teases with hints of cantaloupe beneath the assertive citrus, ending with a bright, lemony note. Like all of Burial’s offerings, Surf Wax features the lurid, comic book-inspired stylings of resident artist David Paul Seymour, whose work we’ve seen once before here at Booze and Birds. 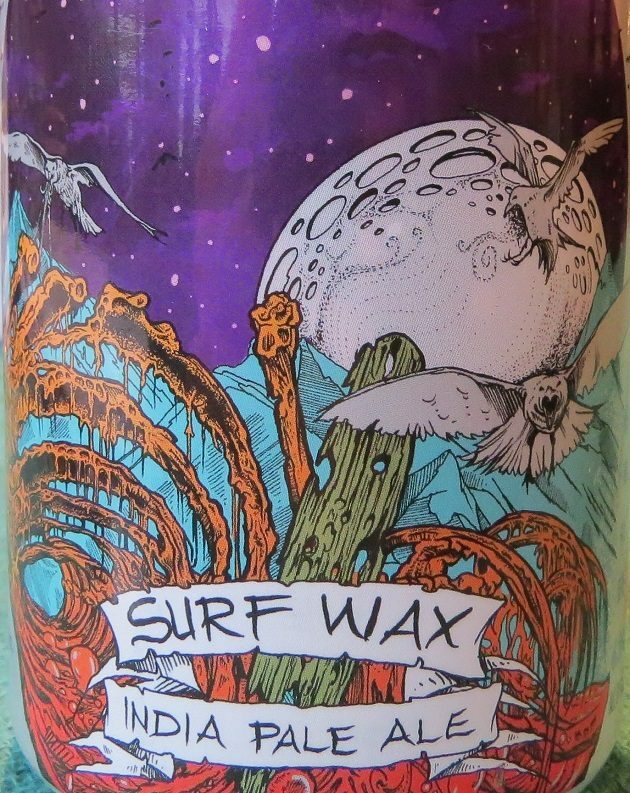 With Surf Wax, he depicts three birds hovering menacingly in front of a moon rising over a rotting surf board. They look like gulls to me, though Surfbirds would have been a nice touch. In any case, Surf Wax makes a great beer to stow in the cooler for your next trip to the beach, out to sea, or for just sitting at home as consolation for a cancelled pelagic trip. Fair enough, Dragan – I hope you’ve liked some of the more recent labels I’ve found.